I met a nice lady, Tylene, earlier this summer. She and her mother had been to the Amish quilt show in Arthur and had seen my Spring Shadows quilt (which won viewer’s choice) and they were so impressed with it that they tracked me down. Tylene’s mother brought me a simple quilt to do an allover design on. 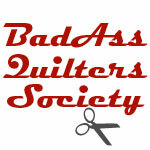 During that first meeting, Tylene talked about her very first quilt that she had ever attempted. It was a paper-pieced New York Beauty quilt. I seriously cannot get over the fact that she did a paper pieced pattern for her FIRST quilt. 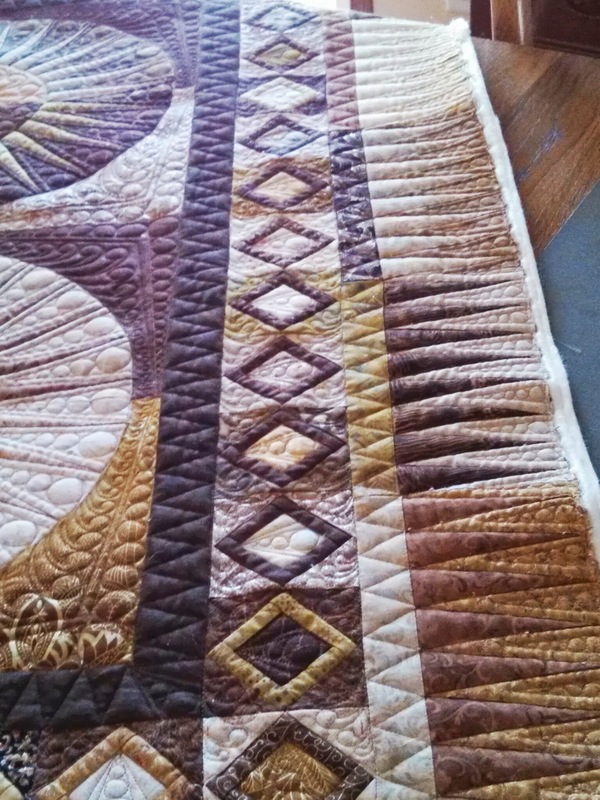 When she finished it, she took it to a local quilt shop to have it quilted. She told me she nearly cried when she picked it up because she felt they had ruined it. We discussed it for a while and I told her to bring it with her when she and her mother came back to pick up her quilt. What she brought was a beautiful quilt that was quilted with a so-so design. I think the worst offense was the quilter had used a 40-wt variegated thread over the entire quilt (even stitching in the ditch). She wanted to know what I would have done, and I told her that the number one thing was the thread weight and color. I’d have used a very thin thread and tried to match the color as much as possible. I would have also played up those beautiful points. 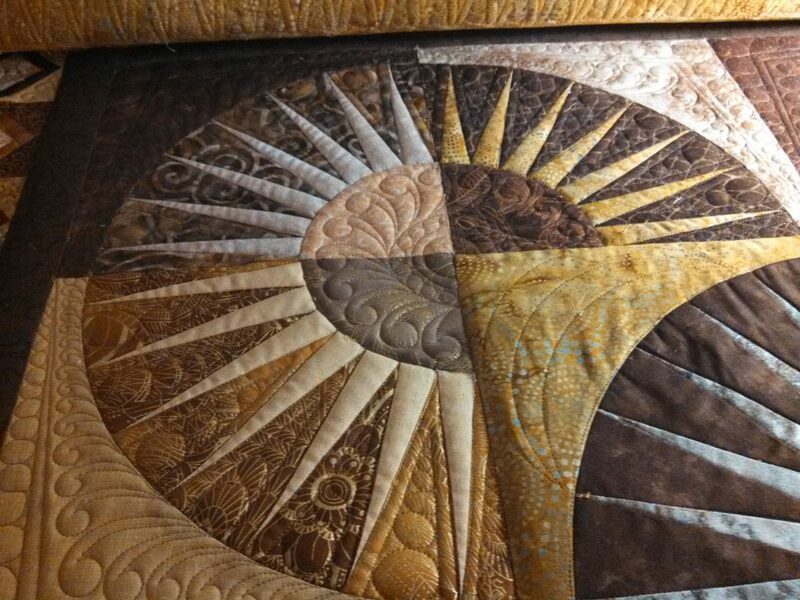 I mean, what’s the point of going to all that work piecing this pattern and not have your quilting highlight it?! 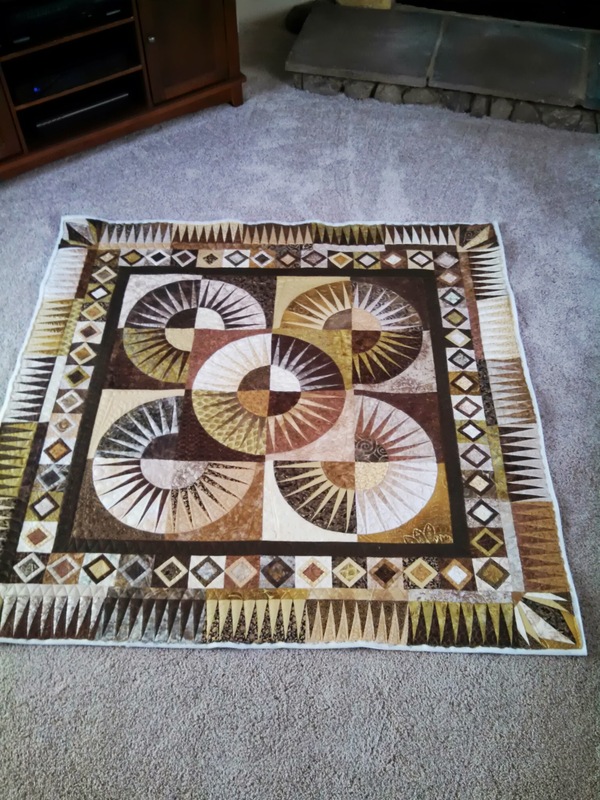 So, Tylene took her quilt home and removed all the original quilter’s stitching, purchased a new backing and brought it back to me to quilt. I used 60wt Bottom Line thread on top and bottom – a medium brown on top and a lighter brown on bottom. I also doubled up the batting, using Quilters Dream wool over 80/20 Legacy blend. I played up the points and stitched in the ditch on all of them and did a 1/4″ echo with graduated circles in each of the “background spikes. I also echoed that same type of motif in the squares border. You can see the details a bit better on the backing fabric. While the piecing wasn’t perfect, it was very good for her first time. 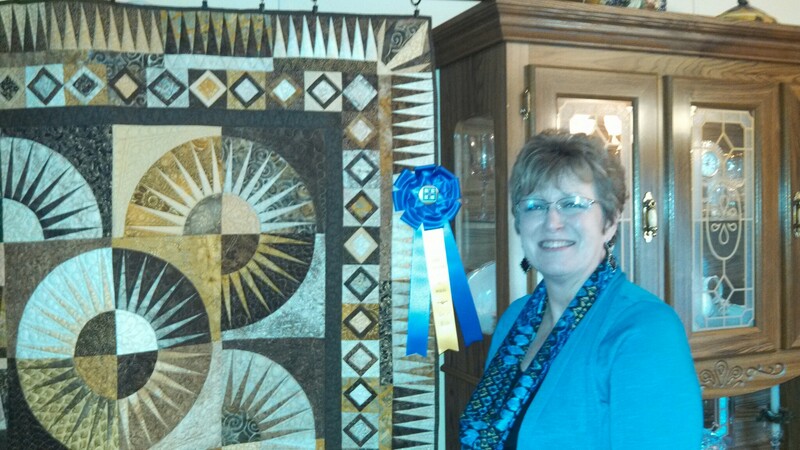 I encouraged her to enter it into the regional quilt show in Effingham, IL and she took home Best of Show. I had to explain to her what that meant. 🙂 She’s thrilled with the results, and so am I. 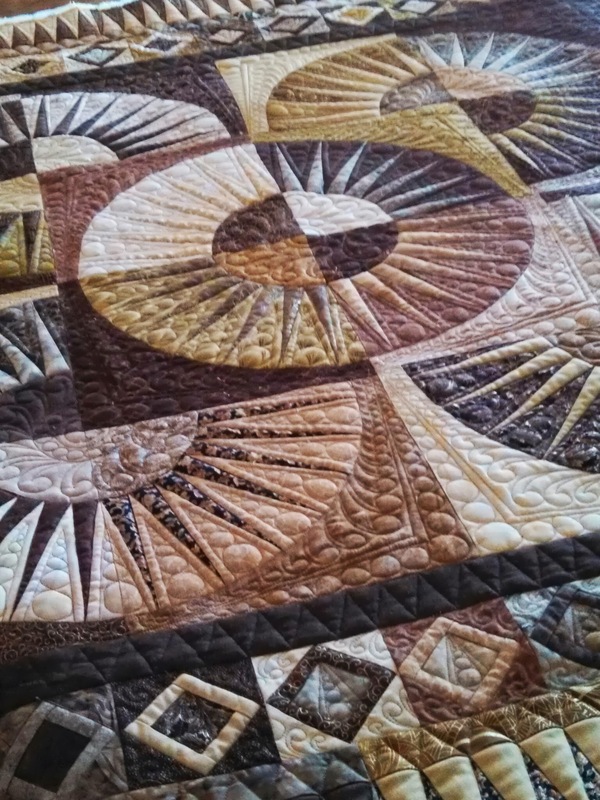 She had it appraised while at the show and the appraiser urged her to enter it in the Paducah Quilt Show next year. I just wish I could have kept it a while longer. Here you can see some of the design that was done originally. I wish I had taken a picture of it prior to her removing the stitches. Tylene and her “Fireworks” quilt with the Best of Show ribbon. 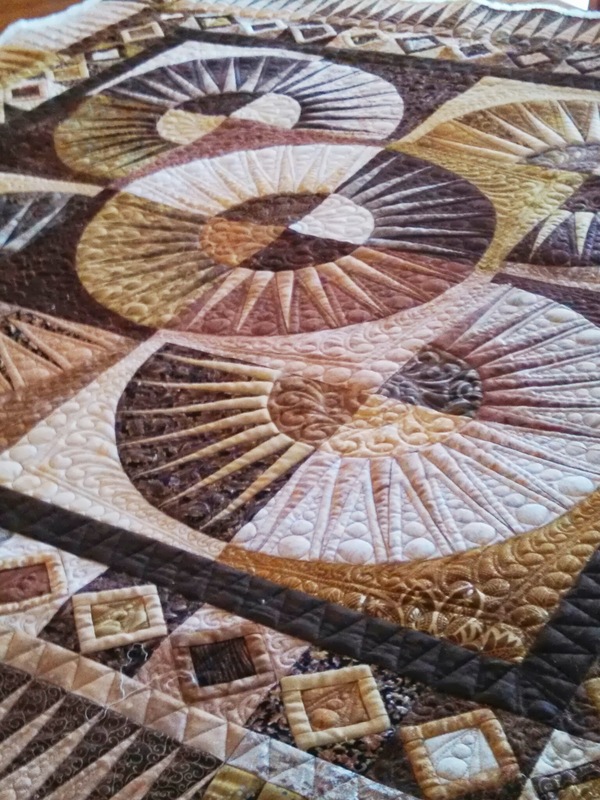 That is beautifully quilted. She should be proud and so should you. Beautiful! You certainly did it justice! 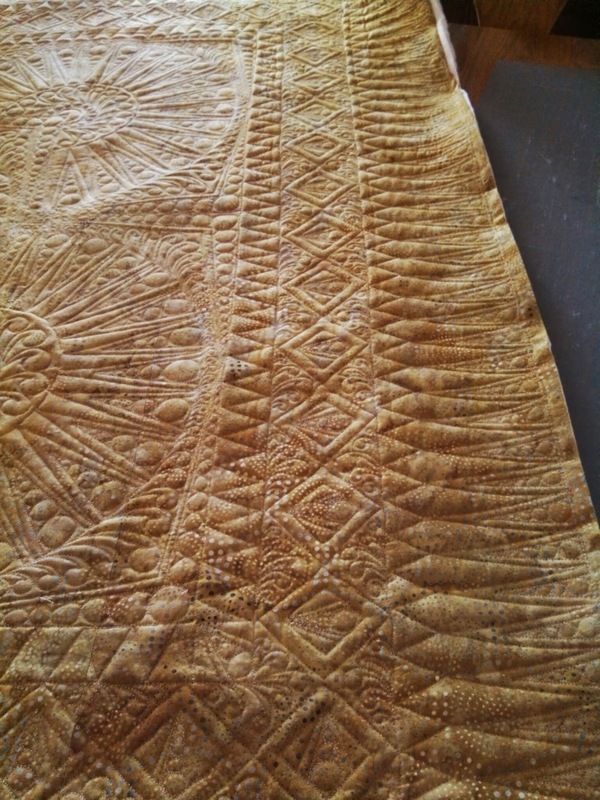 Scary to think what the previous quilting was like.